Dating from 1920, this is the kind of building which attracts you with the solidity of its exterior and impresses you with the finely-worked details of the interior. The gold highlights in the hallway, the classic wooden staircase with turned handrails, the oak parquet floors all give it a warm and familiar atmosphere. This atmosphere continues into the apartments themselves, which are all freshly renovated and brought up to the highest possible standard. This is a superbly proportioned apartment, an inviting hallway, good-sized bedroom and living room, pleasant kitchen, and bathroom with a bathtub spread out across its 58sqm. There is even a petite balcony overlooking the recently-redesigned garden and perfect for enjoying a morning coffee. This apartment makes a great investment, in a very historic part of the city. 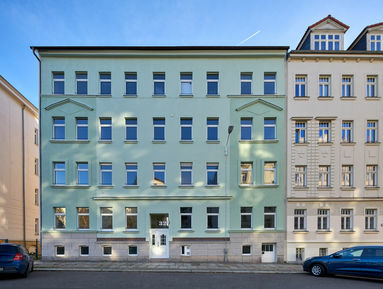 The villas of Gohlis mark the classic epicentre of Leipzig's bourgeoisie. As you walk the streets, you can feel the sense of prestige and heritage emanating from the stately buildings you pass by. This is a peaceful area, which can sometimes feel removed from the youthful start-up spirit of Leipzig’s recent renaissance. Yet the centre is only a short train journey away, and even the hippest locations are easily reached.